This weeks Top Ten Tuesday list (weekly meme hosted by The Broke and the Bookish) is the My Top Ten Books Related Problems. 1. Cleaning my house can be tricky. I have stack of books on my bedside table, in baskets, on end tables. This seems normal, until you realize you have a beautiful set of bookshelves that are currently holding some candles, dried flowers and pictures. You know, anything but books. 2. Sometimes when I'm in meetings, I appear to be paying great attention to the person speaking, but actually I'm wondering what the character in my current book is going to do next. 3. My idea of watching TV includes an open book to read during commercials, or whenever the people talking start to bore me. 4. No matter how bad a book is, no matter how bored I am or how aggravated I'm getting, I can't stop. i have to follow it through to the end. Which is weird, because I don't have any problem not following other things through to the end, like diets, exercise, and cleaning out closets. 5. I'm not a good person to take to the movie based on a book. I think the book is always better than the movie. Gone With the Wind, Pet Sematary, Gone, Girl. The books were always better. There is only one exception, that is Bridget Jones' Diary. In that case, the movie was as good as the book (but still not better). 6. There are very few things I would rather be doing than reading. Sometimes I tell myself to go out at night and do something new. I always end up thinking I would have preferred to be at home reading. 7. Losing my library card is almost as bad as losing my debit card. Not so much anymore, thanks to the wonders of the auto save feature on my iPad, but not being able to put my hands on my library card when I want it causes me great anxiety. 8. I can't sleep unless I read first. So no matter how late I stay up, I have to get at least three chapters in before I can fall asleep. 9. My greed is for books, not money. 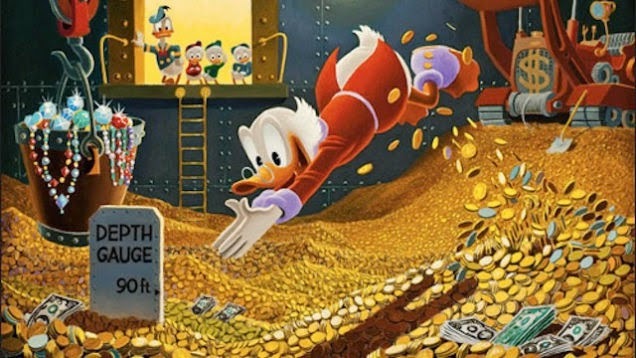 But I would like to be like Scrooge McDuck, diving into an unlimited pool of books. All the books ever in the world, mine, mine, mine. Book problems are great probllems to have!